Watch Shadowhunters Season 2 full episodes online, free and paid options via our partners and affiliates. On Shadowhunters Season 2 Episode 20, Luke and Simon deal with the Seelie Queen, while Alec and Izzy fight a large mass of demons, and a traitor is revealed. On Shadowhunters Season 2 Episode 19, after centuries of being treated poorly, the Downworlders' choice to break with the Shadowhunters, could escalate to war. "Awake, Arise, or Be Forever Fallen"
On Shadowhunters Season 2 Episode 18, the Seelie Queen demands an answer from Magnus and Luke, and everyone is on high alert after a devastating attack. On Shadowhunters Season 2 Episode 17, when it appears that Jonathan is hunting down the mortal mirror for Valentine’s use, Clary worries her brother is evil. On Shadowhunters Season 2 Episode 16, Maia helps Simon out at a Yom Kippur family dinner, while Clary and Jace head out on an unsanctioned mission. On Shadowhunters Season 2 Episode 15, Alec and the rest of the team make prepararations to transport Valentine, while Simon heads down a dark path. On Shadowhunters Season 2 Episode 14, Clary and Jace end up being summoned by the Seelie Queen, while Alec tries to mend fences with the Downworlders. On Shadowhunters Season 2 Episode 13, the Institute decides to try a controversial method of preventing a Downworlder uprising after Shadowhuters are killed. 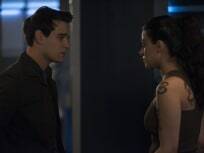 "You Are Not Your Own"
On Shadowhunters Season 2 Episode 12, as the greater demon Azazil remains at large, everything is turned upside down, while Simon looks for help from Isabelle. On Shadowhunters Season 2 Episode 11, after the Soul Sword attack at the Institute, everyone must find a way to deal with the aftermath and move forward. "By the Light of Dawn"
On Shadowhunters Season 2 Episode 10, the Shadowhunters must act fast to rescue their loved one as Valentine's plan for the Soul Sword continues. On Shadowhunters Season 2 Episode 9, Clary has to worry about hiding from Valentine and the Downworlders, and Iris activating her blood oath. On Shadowhunters Season 2 Episode 8, Alec uses his brother's Rune Ceremony as an opportunity to introduce Magnus to his family, and Simon makes a bold move. On Shadowhunters Season 2 Episode 7, Luke's sister claims she's innocent which causes trouble between Clary and Luke, while Simon gets unexpected dating advice. On Shadowhunters Season 2 Episode 6, Isabelle and Clary are sent on a mission to visit the Iron Sisters, while Simon and Maia are determined to find Luke. On Shadowhunters Season 2 Episode 5, Simon moves home, but struggles to his new life, while the Shadowhunters regroup following the attack on the Institute. On Shadowhunters Season 2 Episode 4, Clary assists Alec and Isabelle in finding a powerful demon but the consequences of the mission could change everything. On Shadowhunters Season 2 Episode 3, all of the shadownhunters are frantically searching for Jace but they all have their own reasons for wanting to find him. On Shadowhunters Season 2 Episode 2, before the other Shadowhunters can locate and kill Jace, Alec and Isabelle frantically race to find him.